Meet the creative and savvy executives and designers who mastermind some of the biggest corporate brands to influence what you buy. Houston hotel developer had his first property at 28 and isn't slowing down. UNT linguistics alumni bring meaning to human language, preserve history and improve communication. UNT progress continues with new initiatives and buildings. Interdisciplinary junior receives scholarship thanks to dedicated alumni. UNT alum committed to improving education in his community of Oak Cliff. UNT alumni won big at the 59th Annual Grammy Awards in February -- eight awards in eight categories. UNT is at the forefront of collaboration and pushing progress beyond invention to innovation. The Mean Green football team understands the meaning of success from bowl game to graduation. Alumna recalls life on campus with her dad. Business alumna Emily Allegretto was 15 years old when she found her passion helping others. UNT's Division of Jazz Studies releases CDs to celebrate the program's 70th anniversary. UNT alum T.C. Broadnax returns to Texas as Dallas' city manager, serving 1.3 million residents. Alumna takes pride in watching the Heart of Dallas Bowl. Biostatistics professor uses statistics to determine the best treatment for pediatric patients. UNT engineering students compete in NASA's Student Launch rocket competition for first time. Assistant professor of biology researches link between pollution and cardiovascular health. UNT professor of kinesiology and health promotion provides underrepresented students opportunities. UNT professor Priscilla Ybarra's book looks at Mexican Americans' role in environmentalism. 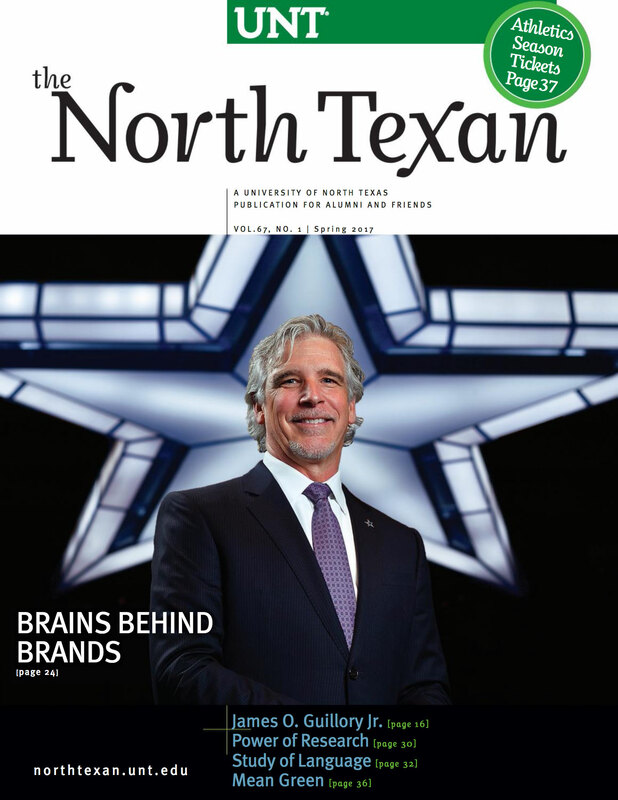 New UNT mobile app; building food pantries; showing school spirit. Members of the UNT Alumni Association fund annual scholarships. Numerous building and renovation projects will strengthen academics and research. UNT professor Chad Trulson focuses on juvenile sentencing in new book. Art alumna's sculptures receive internet attention and celebrity fans. How can you plan a trip for your multi-generational family? Autism activist Temple Grandin discusses journey living with autism spectrum disorder. UNT alumna Rachael Knight makes mark working on the Oscars and Emmys and other awards shows. UNT alumnus Jeffrey Schmidt heads Theatre 3 in Dallas. Chilean government awards $15 million for conservation program at the Cape Horn Biosphere Reserve. UNT alumna Naomi S. Adams' quilts make use of untraditional material. UNT alumna Liz Cook's elaborate tattoo designs inspire large online following. UNT professor Ed Soph inducted into Percussive Arts Society Hall of Fame. UNT alumna Stephanie Stuart portrays Marilyn Monroe. UNT alumna Chantel Terrell sews up fashionable career at Fabletics. UNT student Howard Dietz wins two international saxophone competitions. UNT alumnus Dan Higgins' music heard from "The Simpsons" to "La La Land." Alumnus reminisces about the Student Union Building. Business computer information systems senior wins first place in the North American region. Sport a "Mean Green" license plate and help support student scholarships.